Our Samaritan’s Purse team has been distributing kerosene heaters and blankets to refugees who fled to Duhok, a mountain-encircled city in northern Iraq. We discovered a whole village of Chaldean Christians who had found shelter in one of the public buildings. There were nursing women, turbaned men, and cavorting children. Families sat on thin mattresses strewn across the marble floors, with tragically small and assorted piles of belongings: the odd pot or pan, an embroidered pillow here or there, and the occasional teddy bear. The men seemed to be taking it worst: several of them took repetitive journeys up and down the echoing halls with vacant expressions. Families of Iraqis are crammed into small spaces and are unprepared for the winter that lies ahead. These people were from the village of Tilskof and had fled suddenly at midnight. The first thing they knew was that soldiers from the Peshmerga (the Kurdish army) were shouting wildly for everyone to leave because ISIS was coming. There was a mad dash in the dark to pick up whatever belongings came to hand, and the whole village scattered on foot. They just escaped with their lives; pictures subsequently taken by the Peshmerga show houses and stores smashed to rubble. 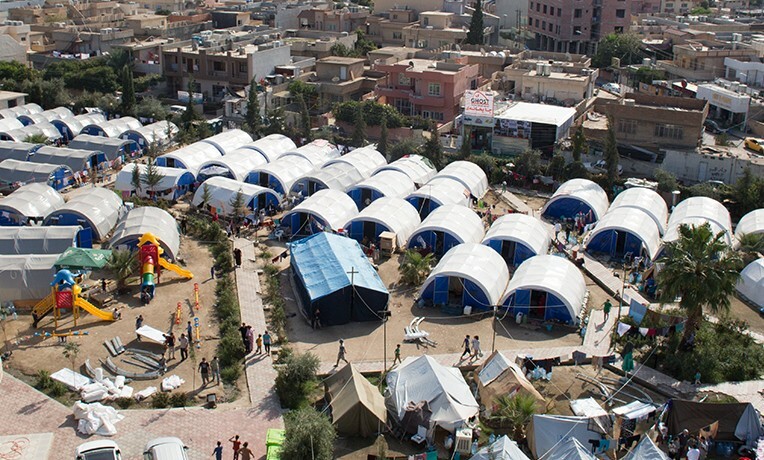 During the following days, the families gradually located each other and congregated at their new shelter. It’s far from ideal: one bathroom per twenty families and no curtains or partitions. Out of respect for the women, the men are currently sleeping in the yard. But that solution won’t last for long. “We don’t know what the future holds because winter is coming,” a Chaldean man said. Like so many others, he was wearing the clothes he came in: thin pants, a T-shirt, and sandals. He has no winter gear. During the distribution of heaters, a man introduced himself as an evangelical Christian. One of the Samaritan’s Purse team members asked him his favorite book of the Bible. 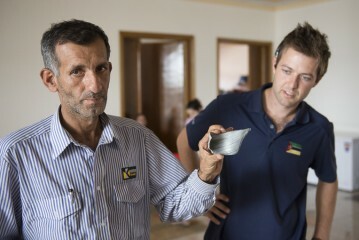 A man shows Samaritan’s Purse staff a piece of shrapnel he found from a mortar shell near his home before he and his family fled. 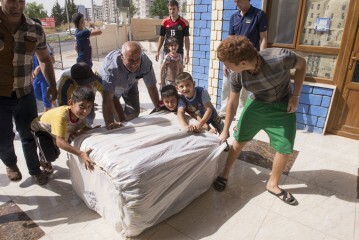 We also brought blankets to a group of Christians who had found temporary refuge in a church in Duhok. 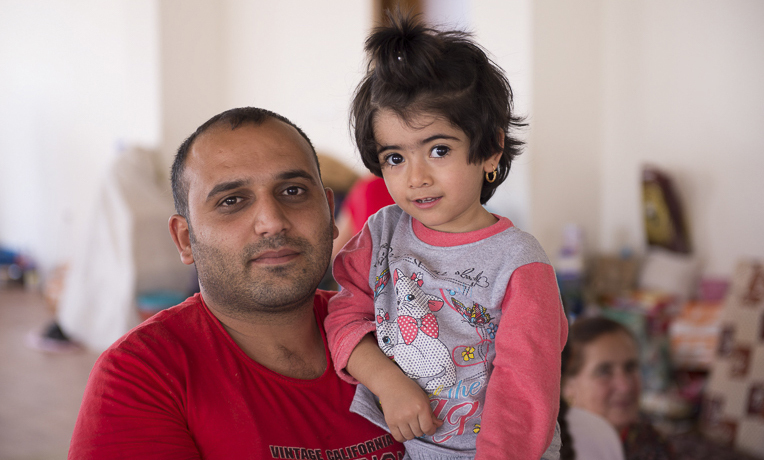 Here I met Gabriel*, who had fled from the town of Qaraqosh when ISIS pounced. His English was good since he had worked for two years as an interpreter for the U.S. military. He told me that over the years, he had managed to amass a fortune of $800,000; he was almost apologetic that it was all in real estate and he was now dependent on our charity. He wants to immigrate to the United States. He recounted that, true to pattern, ISIS had attacked Qaraqosh at midnight. Amid the shooting and mayhem, Gabriel got away but had to leave his elderly mother behind. For 20 days the brutal invaders intimidated her, trying to get her to convert to Islam. She refused. Hers might have been one more tragic story, but a Muslim family drove back into Qaraqosh to rescue her. How amazing that Muslims should unknowingly obey the Word of God. And hold back those stumbling to the slaughter,” (Proverbs 24:11, NKJV). Iraqis offload heaters and blankets from the Samaritan’s Purse truck. These items will help them get through the winter, but they need more. We have also witnessed compassion reaching the other way across the religions. I met a Chaldean priest who is distributing aid without distinction to Christians, Yazidis, and Muslims who have taken refuge in his village. Meanwhile the weather is turning. Up in the mountains the evenings are already chilly. As winter comes, that chill will turn into 3 feet of snow, and these people aren’t prepared. They continue to need more help. Editor’s Note: An airlift from Samaritan’s Purse arrived in Iraq on Wednesday, October 15, with more supplies for distribution. Read more here. 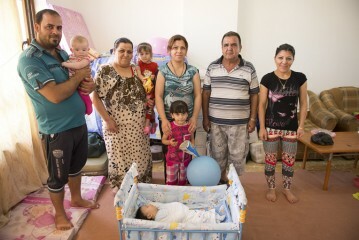 Middle East Relief Samaritan's Purse is providing shelter, food, clothing, and more to families fleeing from Islamic militants. We also support local ministry partners throughout the region as they provide physical relief in Jesus' Name to suffering people.